Most people consider me a relatively positive person, but I pale in comparison to the author and blogger Barbara Younger. A successful author of over twenty books, Barbara somehow finds time to blog about her experience with menopause and endometrial cancer. Her creative gifts are apparent as she deftly discusses these topics with humor and grace. 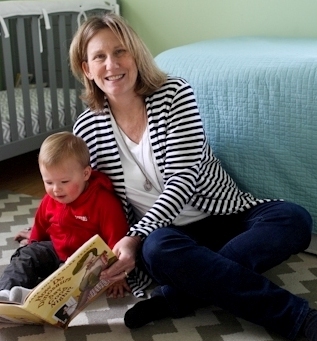 Recently, I caught up with Barbara to chat with her about her blogs, her books and her adorable grandson, Mazen. When I was in third grade, our teacher gave us a writing prompt, something about a silver loving cup discovered in a horse barn. A shy child, I wasn’t happy when she made us read our stories out loud. After I read mine, she said, “Barbara, your story is really good.” In that moment, I understood that I might have a way with words. In fifth grade, I won First Prize in an Archie comic book writing contest, and in sixth grade, I won two school writing contests. Those early successes showed me how it feels to have others appreciate my writing and probably gave me the courage I’ve needed to endure hundreds of rejection letters. Where did you grow up and how did where you grew up shape your writing? I grew up in Towson, a Baltimore suburb. Our schools were good, and they stressed reading and writing. Our libraries were good, too! My home was a creative one, filled with books, music, art, dogs and cats, and lively conversation. How has being a mother and grandmother changed you as a writer? As a mom to two girls, I learned the struggles kids go through and what’s important to them. As the grandmother of a little boy, I’ve discovered that toy trucks have personalities. They can even eat oatmeal and take a sip of milk. Who knew! I hope to write a truck picture book in the next few months. I do my best fresh writing in the morning when I’m the most energetic. I’d like to figure out how to work harder and longer and not be so influenced by energy and mood. A challenge! I’m happy editing any time. Chopping and rearranging words are favorite activities. Describe some of the books and authors who have influenced you as a writer. As a kid, I was nuts over Beverly Clearly, and as a young children’s librarian, I loved Judy Blume’s Fudge books. In recent years I’ve admired the whimsy of Polly Horvath; the depth of Kevin Henke’s novels; and my friend Lisa Doan’s The Berenson Schemes, where funny things happen fast. Blogging has sparked an interest in creative nonfiction and humor writing. I’m studying two masters, Erma Bombeck and Nora Ephron, for their ability to capture what’s amusing, confounding, and significant about the stuff of every day. I’ve got a novel in progress, Eva Heaven and the Summer Pie Blog. I’ve had trouble letting the main character sing, so I’m soon to start another round. My insightful agent, Erzsi Deak, suggests Eva is too full of herself. Hoping to fix that! 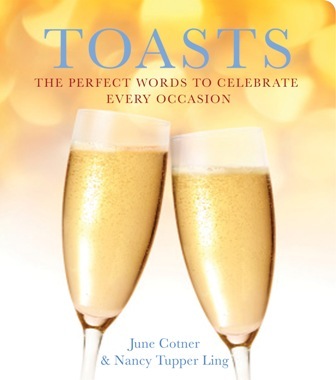 I’m pleased to have fourteen selections in Toasts: The Perfect Words to Celebrate Every Occasion by June Cotner and Nancy Tupper Ling, coming this fall from Viva Editions. No appearances at the moment but I’m always looking for guests posts for Friend for the Ride. It’s okay if you’re young! We’ll find a topic that suits you. If you’ve got a book you’d like me to promote, I’ll buy a copy and offer it as a giveaway to go along with your post. Email me at BKYounger at gmail.com. Thanks! You can read more about Barbara at her blog https://friendfortheride.wordpress.com and purchase her books at your local bookstore or online book seller. Fun post! Barbara is every bit as witty and clever in real life as she is in print. Go, Barbara! Barb is a fun friend to have! I miss our conversations as she is always a joy to be around. It is wonderful hearing how she got her start as she finds more ways to ask about you than to talk about herself. My daughter looks forward to Eva Heaven, though she was upset that the editor did not like the original copy. BTW, what kid that age is NOT full of themselves? It’s been so much fun following Barbara on her blog. Her frank discussion of menopause, and now her cancer surgery, is refreshing and very informative. Erma Bombeck always hit the mark with her wife/mother stories, and now I believe Barbara is doing the same in the world of menopause and aging. Kudos!